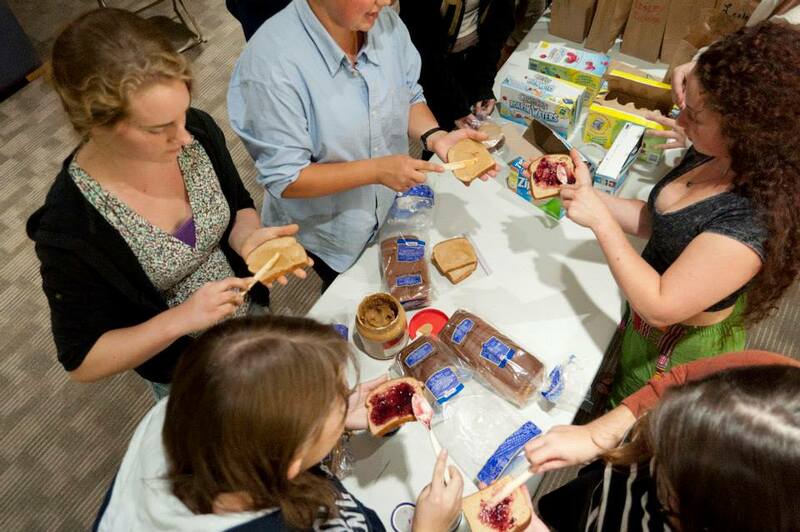 Every Tuesday night at 9:30 pm, dozens of Lesley students come together to make something beautiful: peanut butter and jelly sandwiches. Lesley Delivers is a Community Service Club, a student-run organization that brings people together to assemble brown bag lunches, and then distribute them to the hungry and homeless people of Harvard Square. Lesley Delivers is a program meant to not only feed the hungry people of the surrounding areas, but also to recognize the homeless as equals and help erase the stigma that can surround the homeless population. Separate loops around the square are done so more space can be covered, and more people can be fed. The program runs all year long, but the call for volunteers is increasing as the weather gets colder. Because the walk to, around and back from Harvard Square takes somewhere around an hour, many people are discouraged by the snow, wind and plummeting temperatures. But they shouldn’t let that stop them. Yes, we all know how brutal New England winters can be; but most of us have the comfort of fuzzy socks and a thermostat to come home to. Many of the friends encountered during runs at Lesley Delivers don’t have this luxury, and will spend most of the winter trying to stay warm. Brave volunteers can help alleviate one more worry by providing a sandwich and a smile. In the warmer, end of summer months, Lesley Delivers is brimming with volunteers. But as the temperature drops, so does the number of participants. The cold that scares most of us into staying inside with a cup of hot chocolate is just one of the realities of living without a home. Anyone walking around campus has almost surely seen the signs for recent Hunger and Homelessness Awareness Week, held annually the week before Thanksgiving. Hunger and Homelessness Awareness Week is a national movement that, according to the website for The National Coalition for the Homeless, aims to “not only brings greater awareness to your community, but also helps to promote the national endeavor to end hunger and homelessness.” Events around campus in support of this include a coat drive, a can collection, additional Lesley Delivers outings and much more. Every person you meet has their own unique history, their own fingerprint in the world. Often, and especially in Harvard Square, it’s easy to get caught up in the rush to catch the next bus or get to work on time. Because of the stigma that is associated with homelessness, the people living on the streets of Cambridge are accustomed to being overlooked and ignored. The people who sleep on the benches or in the pit by the T station are no different from the people who surround you in class: we are all humans, no matter what each person’s back story may be. And every Tuesday night, Lesley Delivers makes sure that the homeless feel a little more human, by reaching out to them, one sandwich at a time.